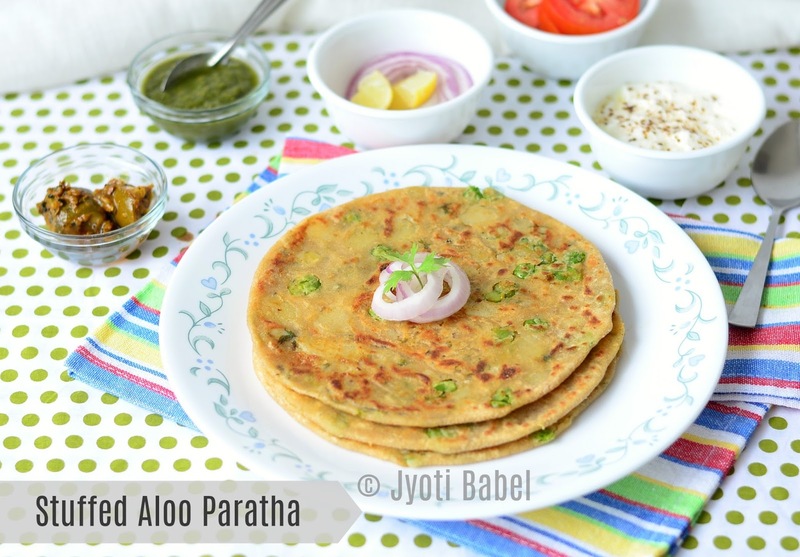 Aloo Paratha is a very popular breakfast recipe in most North Indian households. Even though we love parathas, they are not a regular thing in my house. They make an appearance on the dining table once or twice a month and that too when I run out of veggies in my pantry. But, we like to have parathas for breakfast when we are travelling or are on a vacation and want to have a filling meal. When I was thinking about what to post for the 3rd day of 'Special Weekend Breakfast' theme for BM#79, I realised that I have never posted a paratha recipe on this space. So naturally, I decided to post the recipe for one of the most popular parathas that are made in most homes as a special weekend breakfast. It's none other than Stuffed Aloo Paratha. 1½ cup whole wheat flour. 2-3 tbsp chopped coriander leaves. 1. In a large bowl, add whole wheat flour, salt and knead the dough using water as needed. Cover the dough and let it sit for at least 15 mins before you proceed with rolling. 2. Heat a pan and add oil. When the oil is heated, add the cumin seeds, minced green chillies and grated ginger. Add the crushed green peas and the mashed potatoes and all the spices and seasoning. Give the mixture a good stir. Add chopped coriander leaves and mix again. Heat it for another 2-3 minutes and then turn off the gas. Take the pan off the gas and let the mixture cool completely before using them to fill parathas. 3. In order to make parathas, take the dough, knead it for a few seconds and divide the dough into 6 to 8 equal sized dough balls. 4. Using some dry flour roll the dough ball into a roti about 3cm in radius. Place 2-3 tbsp of the prepared filling in the middle. Join the edges and close it forming a ball. Roll it again about 6 cm in radius. 5. Meanwhile, keep a tava for cooking the paratha on gas flame. Place the rolled paratha on the tava, when one side is done turn it over and heat on the other side. Brush ghee on the top and turn it over. Brush ghee on the other side as well. Apply pressure with a turning spoon to ensure even cooking. 6. Repeat the same with rest of the dough balls. 7. Serve the parathas with pickle and yoghurt. Enjoy them hot. 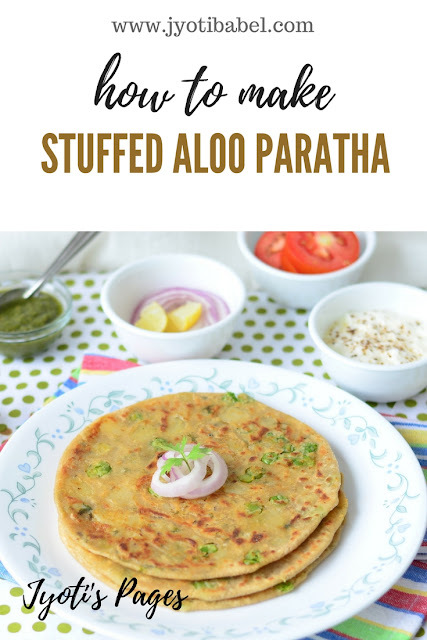 Yea even we love aloo paratha but don't make it that often, your parathas have turned out really so good..
Aloo parathas are all time favourite. Your parathas have come out to be very neat, crisp and with uniformly distributed filling.. Good one.